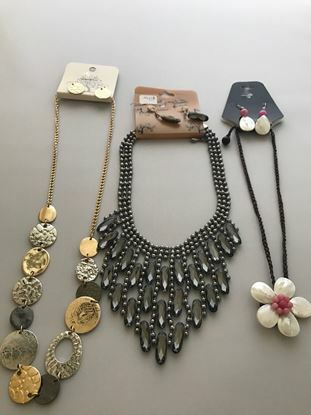 High quality necklace lots. 75% cheaper than wholesale necklaces. Items are selected from major manufacturer of costume jewelry. Necklaces are found in major department stores. Our prices are cheaper than wholesale. Pretty necklaces by White Hot & others A nice mixed assortment of necklaces, all sorts of styles to suit all sorts of customers. 60 Necklaces for only $58 includes free shipping. 71 pieces for only $99 Free Shipping mail included. The styles will be mixed, photo represents just a sample of what you may receive. The majority of them are from a Quality Mall Store, which we can not mention their name in our blasts due to closeout privacy regulations. Average price tags are from $14-$24. 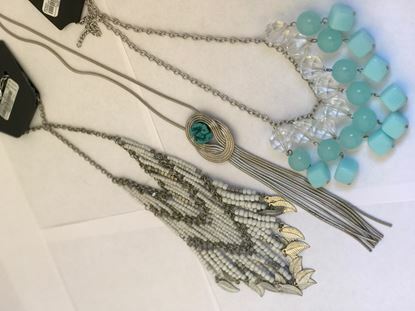 Necklaces with matching earrings. 61 sets for $99 ($1.62/piece). ♥In demand. Hard to find sets.